Frogs and toads are turning up in Alaska with shrunken hind legs, malformed lower jaws and the occasional extra limb, and biologists want to know why. Tessler said there is no way to know if these abnormalities are increasing, since biologists have just recently begun scrutinizing Alaska’s amphibians. Tessler and several dozen scientists gathered in Juneau in mid-February to coordinate efforts to learn more about Alaska’s amphibians. Biologists from Oregon, Wisconsin, Montana, Colorado and across Alaska shared expertise and strategies at the Second Alaska Amphibian Conference. Scientists discussed ways to integrate studies in Alaska with national research and monitoring efforts. “We had some of the very heavy hitters in amphibian research, conservation and monitoring,” Tessler said. Among other things, biologists looked at the current and future threats to amphibians, how global climate change may be affecting amphibian populations in Alaska, and factors contributing to wood frog abnormalities on the Kenai National Wildlife Refuge. Other presentations focused on effective ways to study Alaska’s often elusive amphibians. “We discussed various methods of monitoring, different statistical approaches for looking at amphibians, and different habitat characteristics we might want to monitor in conjunction with amphibian populations,” Tessler said. An important aspect of the conference was establishing a standard frame of reference for amphibian research in Alaska, guidelines that will make it easier for scientists to share data and contribute to a statewide amphibian occurrence database. By coordinating protocols, a scientist seeking answers to specific questions about amphibians in Glacier Bay will be able to contribute potentially valuable data to researchers in the Interior studying changes to amphibians and their habitats. “We also looked at ways to standardize screening for disease, especially chytrid fungus, which has been implicated in die-offs worldwide, and it has shown up here in Alaska,” Tessler said. Researchers monitoring frog populations, such as Dr. Cynthia Carey of Colorado, have seen dramatic examples of amphibian die-offs in recent years. Populations haven’t just diminished, they’ve completely disappeared. An amphibian monitor at Davidson Lake near the Davidson Glacier. 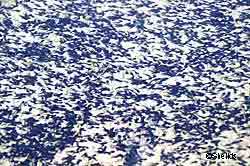 Tadpoles are found in the icy waters of this lake. Photo by Tim Shields. 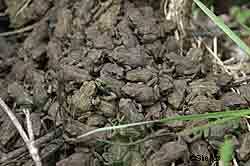 Wood frogs and boreal toads are the most common and widespread amphibians in Alaska. One species of newt and two species of salamanders are found in Southeast Alaska, but very little is known about these small, scattered populations. Scientists looked at some of the stressors and drivers affecting amphibians in Alaska. Stressors are deleterious, while drivers are important factors such as climate change that may affect amphibians positively or negatively. Haines herpetologist Tim Shields has monitored toad populations in northern Southeast Alaska since 2002. He’s found toad tadpoles in the frigid waters of the lake below the Davidson Glacier, in trash-filled puddles near industrial areas, in gravel pits and in pristine marshes. Amphibian populations really fluctuate from year to year, he said, but he thinks there is a trend in Alaska. Last year Shields monitored 11 sites in the Haines area and looked at literally millions of toad tadpoles. He said even in good conditions, very few of those tadpoles make it to adulthood – as few as one in 10,000. Toad tadpoles. Photo by Tim Shields. Shields is the executive director of the Haines-based Takshanuk Watershed Council, and most of his work is related to salmon habitat issues. Monitoring amphibians is largely a labor of love, he said, and he’s developing a team of volunteers to help with the research. He wants to document the distribution of various species, do disease and deformity surveys, and monitor specific sites. The chytrid fungus is not the only amphibian killer at large, and Dr. Carey pointed out that some populations of amphibians are resistant to it. Different amphibians are more susceptible than others. Tessler said a variety of stressors working in concert are probably responsible for the widespread decline of many different species of amphibians. Other factors include draining and development of wetlands, habitat loss and water pollution. Amphibians are extremely sensitive to changes in water quality and water chemistry. 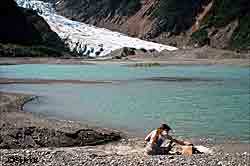 Riley Woodford is a writer with the Alaska Department of Fish and Game, Division of Wildlife Conservation.